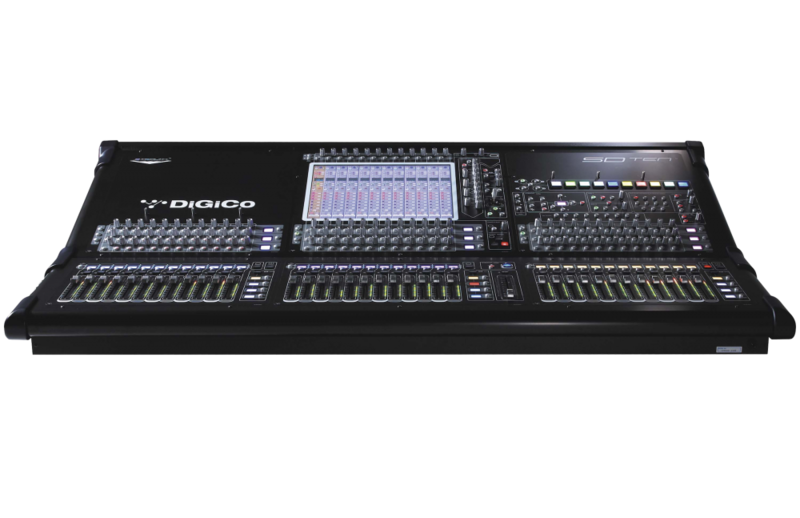 SD Ten features three banks of 12 motorised faders and one master fader, each of which benefits from its own high resolution LED bar graph meter. In the centre of the worksurface sits the familiar 15-inch backlit colour-keyed TFT touch screen, home of the console’s super-intuitive control interface. The sheer intelligence of the SD Ten means even the most complex of tasks become quick and easy: engineers can recall or save presets on the channel strip; and recall or save snapshots using the master screen or hard wired switches on the console. In addition, special functions can be assigned and accessed instantly via the console’s 40 Smart Key Macros (accessible via four layers of 10 RGB backlit keys) at the push of a button. It really is that simple. The SD Ten boasts 96 processing channels (12 of these are Flexi Channels, configurable as either mono or stereo) at 48kHz/96kHz, which is the equivalent of 108 channels of full DSP processing. Standard channel processing, whether inputs or outputs, includes Channel Delay, Single and Multi Channel Presets, Dual insert points, Hi- and Lo-pass filters @ 24dB/octave, four-band parametric EQ with band curve selection, DiGiCo’s DYN 1 (Compressor, De-esser or assignable Multi Channel Compressor) and DYN 2 (Gate, Compressor or Ducker). The console also benefits from 16 Dynamic EQ processors, all of which can be assigned to any of the input or output channels. These powerful processors offer Dynamic processing on each of the four standard parametric bands, plus there are also 16 assignable Multiband Compressors and 16 assignable DiGiTubes; and no matter how the console is set up, the user won’t lose any resources, as all channels are equipped to provide the same high quality signal path and feature set. The master section incorporates 24 gangable 32-band graphic EQs, 16 stereo effects (selectable from a palette of 33), and 12 control groups (VCAs); and using snapshots, engineers can now switch between complete configurations in any live environment easier than ever before, be it at rehearsals, during system setup, or even at a show. Included are 48 busses, which can be configured as 48 mono or 24 stereo groups / auxiliary busses or anywhere in between; and in addition to these busses, for further configurability, we’ve provided a 16 x 16 output matrix, dual solo busses, and a Master buss. Essentially, users have the equivalent of 71 busses of DSP at their disposal.